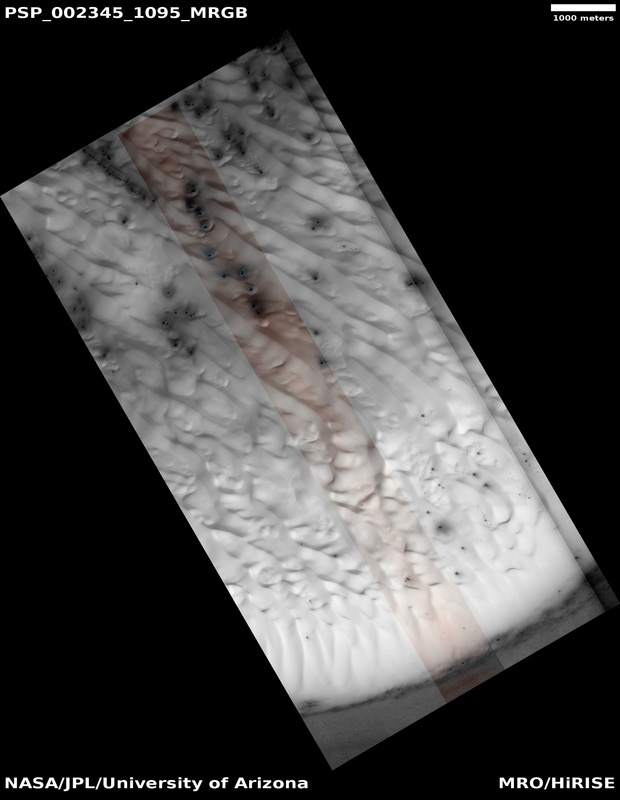 The South Polar layered deposits are a stack of layered ice up to 3000 meters thick which is similar to terrestrial ice sheets. In places, this stack extends up to 1100 kilometers from the pole and many of the impact craters surrounding this ice-sheet appear to be filled with mounds of similar icy material and also sand dunes. 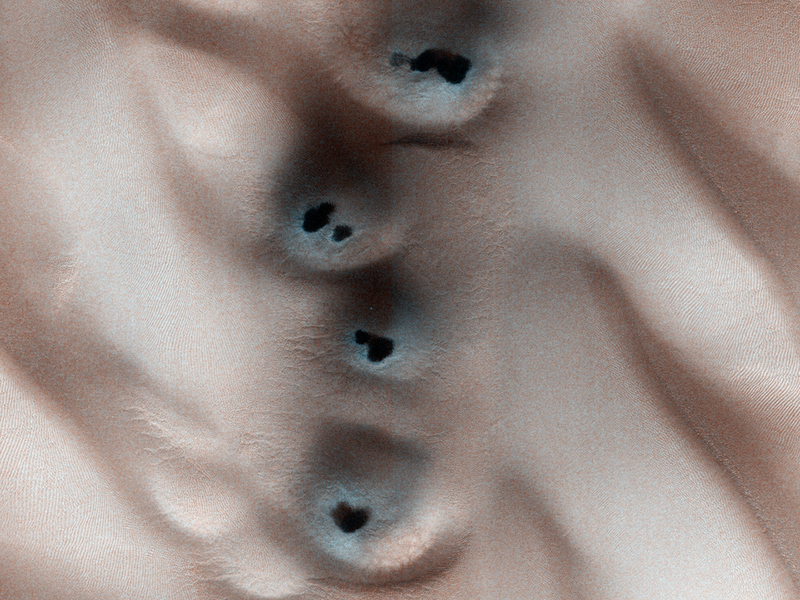 This image shows the material within one of these near-polar craters. The crater is about 44 kilometers across and contains a mound of material about 23 kilometers across and 300 meters thick on its northern (south facing) wall. The dark material at the top of the image shows the northern wall of the crater, the bright material that begins near the image top and extends toward the bottom is the surface of the mound. This surface is covered with sand dunes that appear bright as they are still covered by seasonal carbon dioxide frost. 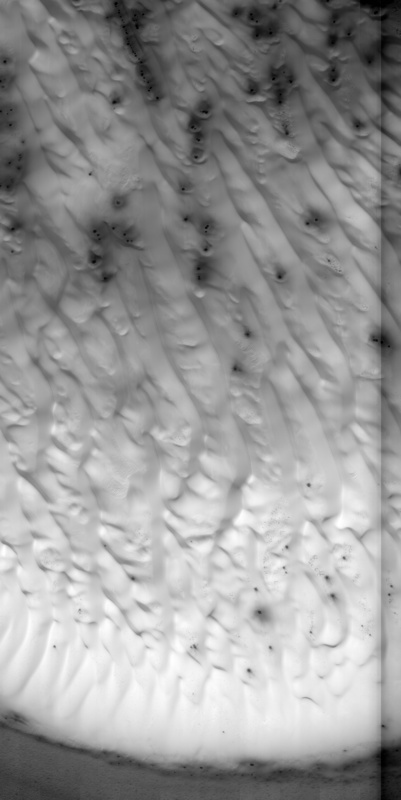 Smaller dunes and ripples can be seen on the surfaces of the larger linear dunes. 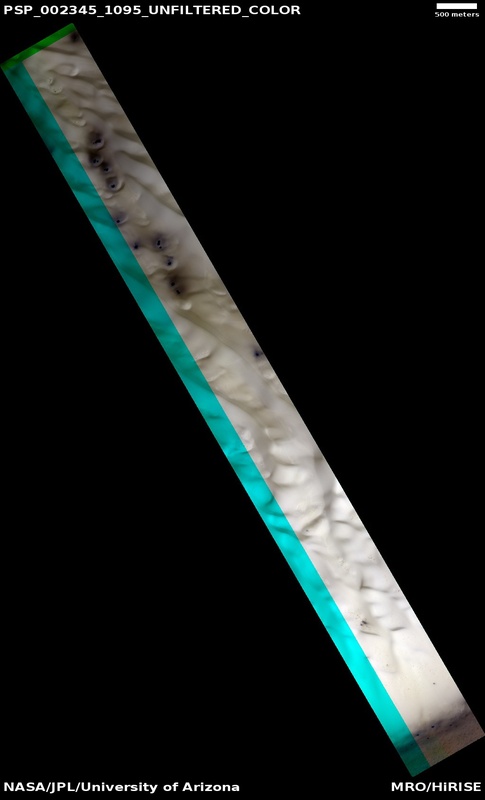 In the low lying areas between dunes, one can see a network of cracks that are reminiscent of the surface of the polar layered deposits, indicating that this mound is probably mostly ice with a thinner and incomplete covering of dunes. The dark spots in the frost cover are characteristic of how this terrain defrosts, and are commonly observed in these locations during this season.